Many people are experiencing financial challenges. But did you know that the Bible contains 2,350 verses dealing with money? Many Christians have been taught what the Bible says about how to handle 10 percent of their income – the area of giving. Although this is crucial, they need to understand God’s perspective of managing the rest of their money as well. This study is one of the most remarkably effective ways to find biblically based answers to your financial questions and difficulties. Through in-depth teaching in a small-group setting, in only 10 weeks people will learn to use money in eternally significant ways that benefit you and your church. This study is our number one resource for transforming the mind and heart of an individual regarding attitudes about money. Designed to be used in a group setting, training of a Volunteer Facilitator is required. If you would like to lead a study and this is your first time, you will need the Complete Training Kit GFT02C. The Training Kit contains a facilitators guide and the regular study workbook so you will not need to order both. Single purchases for personal study will be processed but orders for groups will require a trained Volunteer. 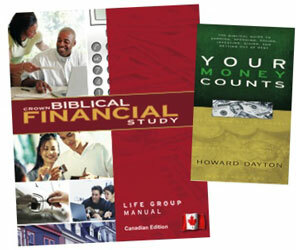 The Biblical Financial Study Individual Set includes 1 Biblical Financial Study Workbook and 1 Your Money Counts.